Could the Banks family be getting back together? That’s probably unlikely. 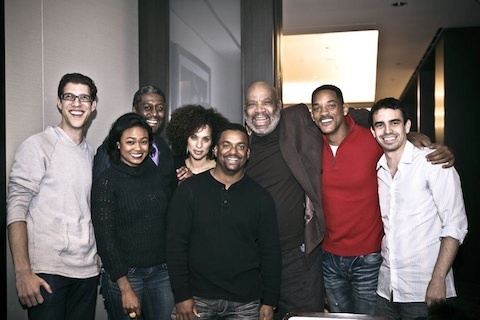 At least, there’s no word of any kind of Fresh Prince of Bel Air reunion, however some of the cast did pose for a photo together, which could give us a general idea of what Philip Banks and (some of) his family would look fifteen years after the series finished its run. Among those shown in the photo below are Tatyana Ali (Ashley), Karyn Parsons (Hillary), Alfonso Ribeiro (Carlton) and James Avery (Philip Banks), and of course, Will Smith. The only actors missing are Janet Hubert-Whitten and Daphne Maxwell Reid, both of whom played Will’s Aunt Vivian. And it would’ve also been amazing if Joseph Marcell (Geoffrey) were there. TMZ says the photo was taken at a luncheon for a charity Parsons founded called Sweet Blackberry.